The guys behind the scenes / in the background are just as important as the ones running the show. 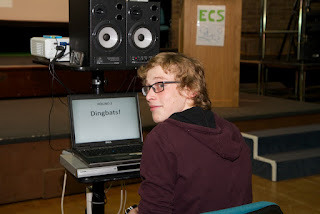 Here is Nick in last night's Dingbats quiz. Nick has just spent half his Sunday trying to get a wireless printer to work for our staff. It should not be a thankless task. THANK YOU NICK!